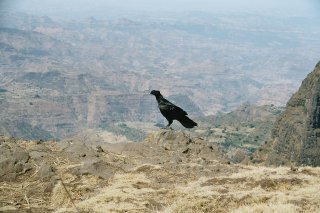 Simien National Park is a spectacular landscape created by erosion and with high biodiversity. It comprises one of the principal mountain massifs of Africa, separated by broad river valleys. A number of peaks rise above 4000m, including Ras Dashen. The dramatic landscape of the Simien Mountains is the result of massive seismic activity in the area about 40 million years ago. Molten lava poured out of the Earth's core reaching a thickness of 3000m. Subsequent erosion over the millennia has left behind the jagged landscape of the Simien Mountains: the gorges, chasms and precipices. The famous pinnacles - the sharp spires that rise abruptly from the surrounding land - are volcanic necks: the solidified lava and last remnant of ancient volcanoes. The mountains are home to three of Ethiopia's larger endemic mammals: the walia ibex, the more common gelada baboons, and the very rarely seen Ethiopian wolves. 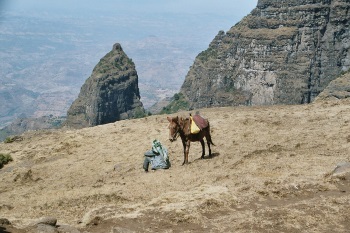 To fully enjoy the Simien Mountains, I did a day trek here. From the town of Debark they bring you deep inside the park, and in the company of a guide and a scout (with gun) you can go hiking. 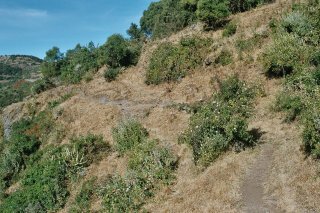 The narrow paths circle around the mountain ridges, through grasslands. In the park there are several kinds of wild animals. Most appealing are the baboons. They can be seen in groups, on cliffs and ridges. It took me almost the whole day to see some of them close up, but on my way back (around 6 pm) groups finally became active and in full view. The best parts of the Simien to me were the views and the canyons. And also its quietness: unusual for Ethiopia, not many people live here. Site visited April 2015. Although I could see only a fraction of this spectacular national park it was still a memorable visit. It is without a doubt one of the best natural sites I have visited so far. 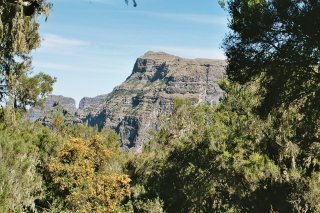 Simien Mountains National Park is one of the sites of inaugural 'class of 1978' which makes it even more interesting. Visiting it is not cheap by any means. In addition to often expensive transportation to the national park you must pay an entrance fee and hire a guide and a scout. As I was short of time I organized only a day trip from Gondar. We started early in the morning with a guide and a driver. At first we drove two and half hours to Debark where we paid all the park fees and did all the required paperwork. The mandatory armed scout joined us in Debark. Next we continued some 15 kilometers to Buyit Ras where we left the car. We hiked slowly along the edge of northern escarpment half way from Buyit Ras to Sankaber. The route is in the height of 3300 meters and the views were absolutely stunning. The distance we walked was not very long comparing to the size of the whole national park but I saw some breathtaking sceneries over the rugged cliffs to the deep and green canyon like valley. While enjoying and photographing the views we saw some birds but what we were looking for was the wonderful gelada baboons. Gelada baboon is an endemic species of Ethiopian Highlands. The geladas have adapted to live in the steep cliffs and high mountain meadows where they pluck and munch grass. 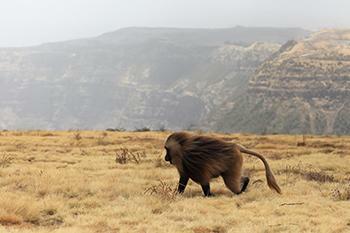 There are large populations of geladas in the Simien Mountains. We found a large herd easily after a short search. It was a magical feeling to stand amid a large crowd of geladas who don’t care about me almost at all. You can get very close to them and hear the smacking when they eat grass. The males are very impressive looking with long hair on their heads and backs. There were also females with small babies hanging on their backs. To fully get a grip on this natural World Heritage Site it would need at the very least two or three days trek. I didn't have time, or money, for it. Was my short trip to the Simien National Park worth all the expenses? I think it really was. But it also made me want to see more of it. I used to work in Gondar Region in the Tourism sector. I visited the Simien more than ten times. Every time I went there it was just incredible and new. Looking across those gigantic mountains was so amazing. Looking down those vast vast countryside, numerous rolling down mountain hills, folding valleys and escarpments, rustic agricultural fields from the top of the gigantic simien is like looking don planet earth from another planet. Unless you see it with your own eyes words are so limited to express how amazing is to see eagles roaring, the Ibex roaming up and down over the gigantic rocks, rows of mountains racing to the skyline, watching endless horizons and much more. the picture of Simien on my Facebook page always tours me throughout the magnificent Simien. I really begs everyone to see Simien ones in life !!! Simien mountains are stunningly beautiful, no doubt about it. We have spent 4 days there, hiked up to Chenek, gone through all kinds of weather... amazing experience, when it comes to nature. I had the chance to compare with Bale Mountains and it was totally different approach to a visitor. The Simien HQ should do something about it, otherwise it might be late soon - despite the beauty of the mountains. In the year 2011, I had the privilege to visit the Siemen National Park. As an Ethiopian this was my dream came true for I was craving to go there at one time. To be honest, it was the most thrilling visit in my life. What is so peculiar of the park is this: it sieges your mentality for good; and as such you don't want to go back to this hectic part of the world, to the cities and towns. It is the right place to worship the savior of the world, to appreciate nature earnestly and to internalize the very reason as to why you are born. Above all it helps you relive from all sorts of routine life. At least, you will stay there for a day or so. Please, visit this wonderful part of our world and you will be surprised where you are!!! I was the first warden of the Simien Mountain National Park, living there from September 1967 to October 1969. I wrote a book about this experience - 'From the Roof of Africa'. I am now a Japanese citizen and chairman of The C.W.Nicol Afan Woodland Trust' in Nagano, Japan. Since our protection and wise use began, 23 endangered species have returned and flourished. We have bears, deer, wild boar, serow, racoon dogs, foxes, hares, badgers, martens, weasels, squirrels, dormice and many other kinds of creatures. Loss of forest, erosion and government corruption were our worst nighmares in Ethiopia. In 1972,I was fortunate to spend a week in the High Simian mountains. A friend and myself has overlanded from South Africa and teamed up with some American friends to trek to Emiet Gogo (Spelling? )at the highest point of this most fantastic range in Africa. It was truly and absolutely awe-inspiring and I shall never forget it. I was told that the view from the top was one of the most scenic panoramas on planet Earth...I agreed. It was humbling. Gelada baboons were common and I was abe to follow a group at close range for many hours. Semian foxes were common so comments about their rarity were puzzling! They fed on the numerous indiginous? rats which were present. We saw lamagyres and found the place where they dropped their bones to smash them up. The Walia ibex remained elusive however. It would be fantastic to do an entomological survey of the area, working on the principle that if many mammals and birds are endemic, then this must follow for insects as well. Dream on, boy! I was privileged to go there in the late 1960's before it was a park, before it had roads, and while those relatively few living there were pastoralists or researchers 1-2 days' serious trek from the nearest road. Then, as apparently now (according to the reviews here and to my children who recently hiked in), it was a place of dramatic and remote beauty, steep in its rifts, and far from the chatter of the man-made world -- in short, spectacular. Outstanding for me still, after many travels around the globe. I have visited the park last year. The main thing that suprised me was nothing but the change of vegetation parallel with the altitude. I am an ethiopian boy ,but to one's surprise i got the chance to see the semin mountians national park only once.It was six years ago since i have visited that wondeful site but still all the moment stapmed on my memory for not lost ever. Everything was more than my expectation: the cliffs,the baboon, the walia ibex, the ethiopian wolves and every thing were marvelouse and they are in deed. Really speaking the place is woth visiting twice, three timess and more ,for sure you will not bored of it. So miss it not !! One of the most spectacular mountain scenery I have ever seen! if you add that with the remoteness of the place, the mystery of Ethiopia and the sight of endemic mammals & birds you are in really true unique natural place. "The most marvelous of all Abyssinian landscapes opened before us as we looked across a gorge that was like a clouded amethyst to the peaks of Simien. A thousand years ago, when the old gods reigned in Ethiopia, they must have played chess with those stupendous crags, for we saw bishops' miters cut in lapis lazuli, castles with the rubi of approaching sunset on their turrets, an emerald knight where the forst crept up on to the rock, and, far away, a king, crowned with sapphire, and guarded by a row of pawns. When the gods exchanged their games for shield and buckler to fight the new men clamouring at their gates, they changed the pieces of their chessboard into mountains. In Simien they stand enchanted, till once again the world is pagan, and the titans and the earth gods lean down from the monstrous cloud banks to wager a game or two on thier sport." Rosita Forbes, "From Red Sea to Blue Nile: A Thousand Miles of Ethiopia" (1925). A good review of the place. I thought you would like the blurb. The trip in Ethiopia was an incredible eye opener and a definite highlight of my East Africa journey going north to Cairo. Having only 30 days to burn in Ethiopia, our band of merry travellers, the Afrilanders from South Africa experienced the intense nature of all that is Ethiopia. This included frantic discussions with an excitable Frenchman at the Ethiopia Kenya border in Farole. He was sure there was an ebola virus outbreak. It was an ominous greeting to a land we knew less than nothing about. Our mission was simply to dispel the myths of overland travel through Africa. We believed in conducting ourselves with dignity and respect while being worthy ambassadors to SA. Ethiopia shatterred all sorts of myths let alone dispel. I digress. We found Ethiopia very green just after the rain season, many areas waterlogged. The trip included the historical route, the orthodox churches, rusting road side tanks and faranji screaming villagers. 50 odd million inhabitants in this country and I am sure we saw all of them. no stretch of road is clear for any length of time. Travel tip: if you stop for a road-side brew, make sure you display your long rubber snake - it keeps the very inquisitive locals at bay. Needless to say, after the incessant presence of the locals, the Simian Mountains offer an unbelievable vista of tranquility. Good old country side peace thrown in with the alleviation of the pandemonium. The Simian mountains just after the rainy season is a mystical place with earths rare creatures hidden within her deep valleys and mountainous peaks. Creatures such as the Walia Ibex, the Simian Fox (incredibly rare) and a very strange baboon species are indigenous to this area. The overland trip skirting these monstrous valleys is a memory in itself, slowly leading you up to significant heights. In fact on our way out, we encountered a Spanish couple kitted out in alpine gear, trekking poles and guides. We stopped our vehicle and accompanied them up to the Ras Dashen peak, 4th highest in Africa. Our naivite of our altitude meant we summited this peak as an afterthought in shorts, windbreakers and flip flops. It was a sight! 30 Community Members have visited.